You guys, I made my first video! I’ve been wanting to do videos for a long time, and I finally bit the bullet and just did it! There are a few lessons learned, like I should choose a different spot to stand where the light isn’t so weird, and have the daughter in the other room tone it down a bit. But I’m just so excited that I did it! 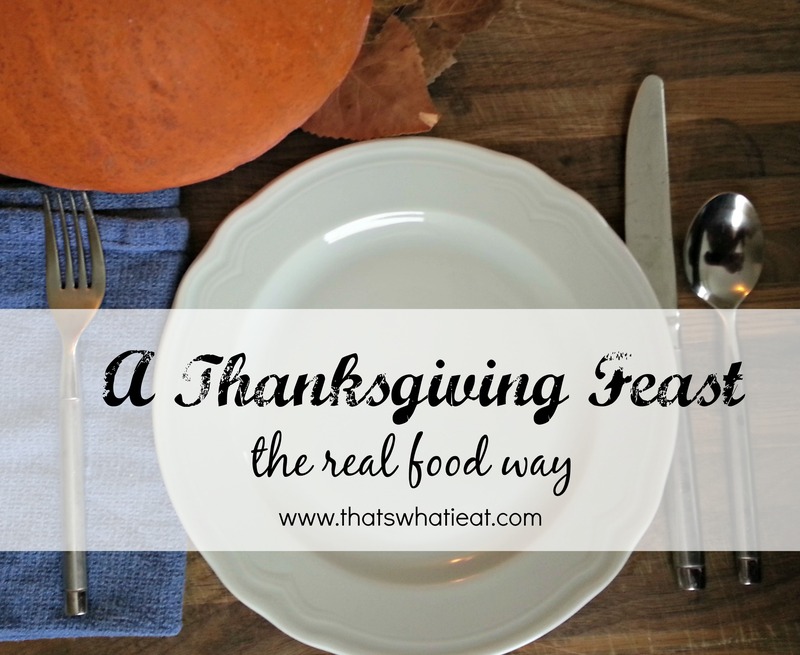 Have you been stressing about your Thanksgiving menu? Well stress no more, because today I’m giving you a gift: A Thanksgiving menu that is healthy and completely composed of Real Food. But most importantly, it is delicious! Allow to sit on turkey for a couple of days in the fridge. Rinse the turkey before cooking. Cook turkey until it reaches a temperature of 165 on the meat thermometer. And here is the video showing you how to get that bird ready to go into the oven. As a note, get the butter way up under the skin better than I did. I wish we had another turkey so we could have done another take, but it is what it is, and even with inadequate butter coverage, that turkey was still super delicious! (You can get a meat thermometer like the one we use right here, and a similar roasting pan is here. For me, it’s not a real Thanksgiving dinner without cranberry sauce. I used to love the goop that was still in the shape of the can, but as I have gotten older and my tastes have matured, I just love a good homemade sauce. This cranberry sauce is not traditional, but it is so yummy! It’s super easy to make, too, you have to give it a try. Again, in my younger days, there was nothing better than stuffing from a box. As we have cut processed foods from our diet, I have found that the boxed stuff just tastes too artificial to me, and I have a hard time gagging it down. I was delighted to find this version of real food stuffing that uses rice instead of bread. What a great idea! Green bean casserole was never a staple on my grandma’s Thanksgiving table, I don’t know why. I actually had never heard of it until I was married and started attending Thanksgiving dinner at different houses, and I wasn’t too sure about it. I recently found this amazing recipe from Alton Brown that is a much healthier and a lot less processed, and way more delicious! The rolls are a completely necessary item for me on Thanksgiving. Of course I recommend my delicious whole wheat dinner rolls. There is really nothing better, and it even makes a great bread for your leftover turkey and cranberry sandwiches the next day. You either love or you hate the goopy marshmallow covered sweet potato dish that seems to be a Thanksgiving constant. This recipe for sweet potatoes has swapped an all natural sweetener of maple syrup for the sugar, and a yummy pecan topping for the sticky, processed marshmallows. I adore sweet potatoes, and this recipe shows them off in a lovely way! I love a nice, fresh salad to brighten up my Thanksgiving plate. Besides, I can never get enough greens! This salad is so beautiful, and I love even more cranberry on my plate, yum! While there are a lot of things that say Thanksgiving to me, one thing that is totally necessary, even more than the turkey is pumpkin pie! But how do you get a Real Food pumpkin pie? I found this pumpkin pie recipe that does a beautiful job, and I love that it has a grain free crust for those who may have a problem with gluten. If you want a more traditional crust, you can always swap it out with this great recipe for crust. So there you have it, a complete Thanksgiving meal made of totally Real Food. The amazing thing about switching to Real Food is just how much more delicious the dishes are! This is sure to be your best Thanksgiving yet. I have to admit that I’ve never tried, never even heard of a dry brine, what a great (and easy) idea. So glad you linked this post up with our Thanksgiving projects in time for me to try it. It’s funny, my mom has always dry brined her turkey, although none of us ever called it that. She does something a little different, but the concept is basically the same. It does make a wonderful turkey. And now I’m totally hungry after reading your post! Those sweet potatoes with maple syrup? YUM! There really is no substitute for maple syrup. The real stuff is amazing. Wow, I have never run into anyone who has done a dry brine before, that’s awesome!